This photo of Yi-Jien Hwa was released to the public in an effort to find the hiker missing in Glacier National Park. WEST GLACIER - A month and more they've waited, this mother and this wife, a world away from home in a place where time has stopped. Theirs is a test of Biblical proportions, 40 days and 40 nights, lingering in suspended animation, their Kalispell motel room a purgatory located somewhere between hoping and believing and knowing. "We said we'd wait 40 days," said Kim Guat. "This is the final stretch." If God does not deliver her son from the wilderness after 40 days, Kim Guat will go home, along with daughter-in-law Siu Yin. Yin's husband, Guat's son, was swallowed by mountains last month, lost in Glacier National Park. And in some ways, Guat and Yin are lost, too, suddenly gone missing as they embarked on their waking vigil, so far from friends and family. They've kept in touch only by computer, typing long reports - prayers, really - on an Internet blog run by a friend named Karcy. Guat knows that the hope held out by her deeply religious family seems, to some, "far beyond reason." "Waiting is not always easy," Guat wrote recently on the blog, "because you want the end to come, and yet you do not know when it will come." Yi-Jien Hwa, a 27-year-old Malaysian man studying at seminary school in Kentucky, was happy, resourceful, meticulous, kind, curious, remarkably intelligent. And he loved to hike. He was tall, at a bit over 6 feet, and fit, and had broken in his boots along Kentucky's rugged Red River Gorge. He hiked up in Michigan's Isle Royale, on Hawaii's Big Island, through the Great Smoky Mountains, and through scenic stretches of America's famed Appalachian Trail. On Aug. 11, he walked into Glacier's alpine wilds with an ambitious itinerary that covered 100 miles in a week, a combined 15,000 feet up and 14,000 more back down, climbing the spine of the Continental Divide from Sperry Glacier to Kintla Lake, near the Canadian border. At least, we must presume he walked into those woods on Aug. 11. Because no one actually saw him hit the trail, and Hwa never made it to his first camp. On Aug. 19, Guat's wait began. Her son didn't phone as planned, and so she called in park rangers. A week went by, then another, with dogs and helicopters and high-mountain rescue teams scouring vast mountainsides. Was Hwa the victim of a glacier crevasse? A rushing river? A grizzly bear? Mountain lion? Did he fall from a cliff? Become hypothermic? Disoriented? Or is he, against all reason, still alive? It's not hard to die in Glacier National Park. Some 231 people have done so in the past 100 years. But by simply disappearing, Hwa joined a very small fraternity of men, just a half-dozen in all, classified as "lost, never found." That's the only remark recorded for brothers Joseph and William Whitehead, the first of Glacier's disappeareds - "lost, never found" in the summer of '24 amid the mountains between Granite Park Chalet and Lake McDonald. Joseph was 29, William 22, when they stepped off the Great Northern Railroad's Oriental Limited out of Chicago, geared for a week or so of tramping around the park. Vince Moravek, author of "It Happened in Glacier National Park," characterized the young men as "cautious and conservative." Joseph was an engineer, his brother a student at Boston's MIT. They weren't the sort of young men who ran big risks, and they wrote home to their mother every day. "We are enjoying ourselves very much and taking no chances of injuring ourselves," Joe wrote on Aug. 20, 1924. He closed this last letter with an assurance. "Don't worry, mother, we won't go into any danger." Four days later, they were seen for the last time, dressed in hiking knickers and smiling, just 10 miles from their final destination. What followed the Whiteheads' disappearance was, in Moravek's words, "the most extensive search operation ever conducted in a national park." At one point, President Coolidge wired the park, advising rangers to spare no expense. "Thirteen rangers, two famous Indian Guides and seven tried mountaineers were out for more than two weeks," Interior Secretary F.M. Goodwin reported on Sept. 16 of that year. "There never has been a search in the national parks conducted with more vigor and effort." His remarks came a day after the search finally was called off. The Whitehead brothers, much to a nation's amazement, had simply vanished. And so began the wait. Some believed the Whiteheads had come to a tragic but natural end. Others thought foul play, perhaps at the hands of bootleggers. "The park is a big place. Measured against that, two young men seem very small indeed." Theirs was Glacier's first long wait, through 40 days and 40 nights and finally 40 years then 40 more, 84 years now, in all. Still waiting. Never knowing. There remains no record as to who was waiting for W. Cosby Bell in the summer of '33, but someone surely must have been. In fact, more than a bit of mystery surrounds Mr. Bell, who hiked up Mount Brown and never hiked back down. Who Bell was, and how he may have met his end, remains unknown. Park records do not indicate his age, nor even the date of his disappearance. All that's known, in fact, is that sometime in July 1933 he went for a climb but was soon listed as "missing, presumed dead." A decade had passed since the Whiteheads' disappearance, and although more than a dozen hikers had died - drowned and frozen and tumbled and hit by falling rocks - all the other bodies were accounted for. But now here was Bell, No. 26 on that list of park deaths, with no more remark than a brief "never returned, never found." Coincidentally, another W. Cosby Bell died that same year, at a Virginia seminary school. That Bell had written a book titled "If a Man Die." He borrowed the title from a scrap of Biblical text, found in the Book of Job: "If a man die, shall he live again?" It is a question, the question, asked by all those left waiting when a man disappears into the wilds - wherever he is, does he live? On Aug. 30, 1934, just one year after the unsuccessful search for Bell, the New York Times reported that "Glacier National Park officials said today that a search is being made for Dr. F.H. Lumley of Columbus, Ohio, whose unclaimed baggage recently was found at Many Glacier Hotel. Dr. Lumley was last heard from Aug. 13 at Goat Haunt Camp." The fact that the New York Times had taken an interest proved the uniquely unnerving nature of people gone vanished in the parks. Tourists just weren't supposed to do that. The Ohio State University professor was just 27, the same age as Yi-Jien Hwa, and once presumed dead marked the 32nd death in the park, but just the fourth disappearance. Others had been drowned and frozen and buried by landslides. One fell into a rock crusher, and one was felled by a falling tree. But in each case, no one waited, as they did now for word of Lumley. Search teams combed the northern park until Sept. 8, when early snows buried all hope, despite desperate pleas and even a reward offered by Lumley's family. He was, quite simply, nowhere. For a decade, people wondered about Lumley, and about Bell and the Whiteheads, too. Then another decade. Then another. The mysterious tragedies faded into the stuff of legend, things that happened then, but not now. Certainly, tourists still died - most of them drowned, but a few had heart attacks, or fell off cliffs, or were carried away in avalanches - but their caskets at least were closed. Most who now worked in the park could not remember the sweeping, open-ended searches that discovered only questions. Until David Paul Wilson, a 21-year-old seasonal park employee, climbed up Going-to-the-Sun Mountain but didn't climb down. His name appears scrawled on the summit register, so searchers knew he'd reached the top, but after that Wilson, like those few before him, simply vanished into the depths of Glacier's alpine beauty. 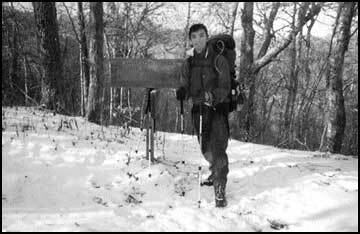 The 90th person to die in Glacier, Wilson, like Hwa, was traveling solo. And from that point on, C.W. Buchholtz writes in "Man in Glacier," the rangers' job forever shifted. "Protecting, rescuing or finding visitors became a full-time occupation of the ranger force, at least as important as preserving the natural features of the park." A full 140 additional people died in the park - some missing for more than a year until their remains were found - before Larry Kimble arrived in spring of 2003. The 40-year-old from Dorr, Mich., was reported missing on June 20, by family who hadn't seen him alive for six weeks. His truck, finally, was found in the Fish Creek area of Glacier Park, at the Rocky Point Trailhead. On the dashboard was perched a park entrance receipt, dated May 29. Not known as an outdoorsman, family and friends couldn't help but wonder what Kimble was doing in a place like that. He didn't own a tent, or a sleeping bag, and had no reservations in the park. And yet there was Kimble's 1998 GMC truck, carefully parked at a trailhead that led off into more than a million acres of undeveloped wilderness. Dogs sought his scent in Montana. Divers sought his body in nearby Lake McDonald. Detectives sought clues to his life in Michigan. And family, yet again, waited. They waited while spring turned to summer, and while summer burned red-hot over the area, flames from the Robert wildfire turning hope to ash. "It'll always be an active case," said Detective Chris Koster, back in Allegan County, Mich., although now "it is sliding toward the back burner." Kimble - the 230th person to, presumably, die in Glacier - was exactly 6 feet, 1 inch tall, and weighed 160 pounds. Which coincidentally, matches precisely the description of the missing Yi-Jien Hwa. Both men also are officially listed on the park register as "missing, presumed dead." With a hiking itinerary as long as Hwa's, and a wilderness as big as this, it's hard to know where to look. Carved into the northern coastline of his Malaysian homeland, up along the South China Sea, is an entire country called Brunei. At 2,200 square miles, it's about the same size of the combined Glacier and Waterton national parks, which adjoin here at the Canadian border, where Hwa's hike was to end. But it's hard to get lost in Brunei, home to 363,000 people. Glacier and Waterton, by contrast, are home to a year-round population of maybe 300. It is just as Moravek wrote of the Whitehead brothers: "The park is a big place. Measured against that, two young men seem very small indeed." In fact, all seven men "lost, never found" here seem astoundingly small when measured against more than a million acres of remote, rugged wildland. It is enough to stretch your faith, to shake even a mother's hope. Kim Guat's been having what she calls a "niggling thought - what if God chooses to act when we least expect Him to, and not when we most want Him to?" And so she and Siu Yin wait, despite the fact that "this last stretch seems to be stretching." Because this isn't just about Yi-Jien anymore. For this family, at least, it's about the very nature of the God Hwa served as a seminary student, and it's about the community that has prayed and sought the Divine and looked for solace and rediscovered the complex depths of their relationship with religion. "If he has kept Yi-Jien alive all this while," his mother said of her God, "then he should see to it that Yi-Jien comes out alive." And if not, well then come Sunday her 40-day vigil is over, and she's going home to Malaysia.